Wild by Nature www.wildbynature.com, a full-size, full-service natural food marketplace, has opened its fifth location, a 22,000-square-foot store in West Islip, New York. Wild by Nature is an independent subsidiary of King Kullen Grocery Co., an iconic Long Island brand that is positioned as “America’s First Supermarket.” Epoch 5 has represented King Kullen, which has 39 supermarkets in Nassau and Suffolk Counties, since 1989. Epoch 5 helped Wild by Nature open its first location in East Setauket nearly 20 years ago, followed by stores in Huntington, Hampton Bays, and Oceanside. Founded on the belief that the production of food should support life, promote well being, and protect the world’s natural resources, Wild by Nature meets the needs of health-conscious consumers and those seeking quality goods and services. Follow Wild by Nature on Facebook and Twitter. Islip Town Councilman Steven J. Flotteron (third from right) was on hand to cut the ribbon with Wild by Nature President Joseph Brown at the recent opening of the new Wild by Nature in West Islip. 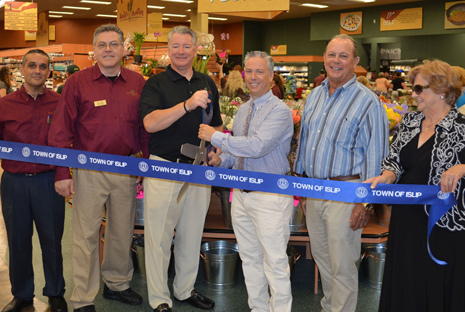 Also joining in the ribbon-cutting ceremony were (from left to right) Wild by Nature Vice President General Manager Michael Infantolino; Wild by Nature West Islip Store Manager Joe Scilla; King Kullen Co-Chairman Ronald Conklin; and West Islip Chamber of Commerce President Nancy Donohue.